Cognitive functioning is very important in old age as a host of complex economic decisions in high-stakes markets, such as health insurance choices and retirement planning, are made in old age when declined cognitive or even dementia is prevalent. The decision making process can be vulnerable to environmental stressors. While it is well known that environmental stressors pose a significant threat to human health, knowledge about their consequences on cognitive abilities, especially among older adults, is limited. Medical studies point to physiological pathways through which air pollution may impair cognitive ability, especially in the case of fine particulate matter (PM2.5). The small size of PM2.5 allows it to remain airborne longer, to penetrate buildings, to be inhaled easier, and to reach and accumulate within brain tissue. Accumulation over time can cause neuroinflammation, leading to symptoms of Alzheimer’s disease, one of the most terrifying and expensive forms of cognitive decline, and other forms of dementia. Other physiological pathways include that pollution exposure increases risk for strokes and then vascular dementia. Air pollution is estimated to account for 21 percent of dementia cases worldwide. Besides more direct physiological pathways, exposure to air pollution may degrade cognitive ability physiologically from early life to old age via persistently constraining the production of human capital, such as schooling and labor force participation. Recent economic studies also show air pollution may also disrupt cognitive functioning through psychological pathways. For example, high concentration of pollutants is significantly associated with headache, cause psychiatric distress, and increase the risk of feeling unhappy and depressed in the United States and China. PM2.5 is the only pollutant among all six atmospheric pollutants in the Air Quality Index (AQI) that causes these psychological disorders. A recent study overcome several key challenges to identify the causal link between air pollution and cognitive ability in old age in China. It exploits individual level longitudinal data, precisely matched timing and geographic location of the tests, rich demographic controls, exogenous changes in air pollution exposure, and information on sorting behavior. The authors find that exposure to air pollution lowers both verbal and math test scores of survey subjects. Their finding of larger negative effect of cumulative than transitory exposure to air pollution provides policy implications that short-term interventions (e.g. wearing face masks on polluted days, rescheduling high-stakes cognitive activities) may be less effective than improving long-term air quality. Not only in China, even in the United States where air pollution is very low, researchers assemble administrative Medicare records on 7.4 million people age 65 and above, tracking their health, demographics, residential exposures to air pollutants, and financial decisions. They show that long-term exposure increases the rate of dementia and the probability to make poor financial decisions in prescription drug insurance markets under Medicare Part D.
Cognitive impairment may negatively affect elderly financial decisions. First, cognitive impairment may increase the cost of cognitive processing required to make decisions. For example, dementia and other forms of cognitive decline increase a set of financial mistakes regarding credit behavior as people age. Medicare beneficiaries diagnosed with dementia are less likely to comprehend key institutional features of insurance markets and more likely to make suboptimal decisions. Second, air pollution may undermine rational risk attitudes and patience when discounting in a remote time horizon. For instance, bad air quality in Manhattan therefore substantially reduces same-day return to the S&P 500. Individuals may also become more aggressive, more selfish, and less cooperative with greater sense of fairness. Violent crime in Chicago is higher when air pollution is heavier. Third, since cognitive impairment can reduce life expectancy, it may reduce investments in health capital, leading to additional chronic conditions that increase the complexity of decisions about health insurance. Altogether, these three channels may provide a preferential foundation linking haze to real world decision making in health insurance market, stock market, and even the decision to commit a crime. The current Ambient Air Quality Standards (AAQS) have only been based on narrowly defined health assessments. 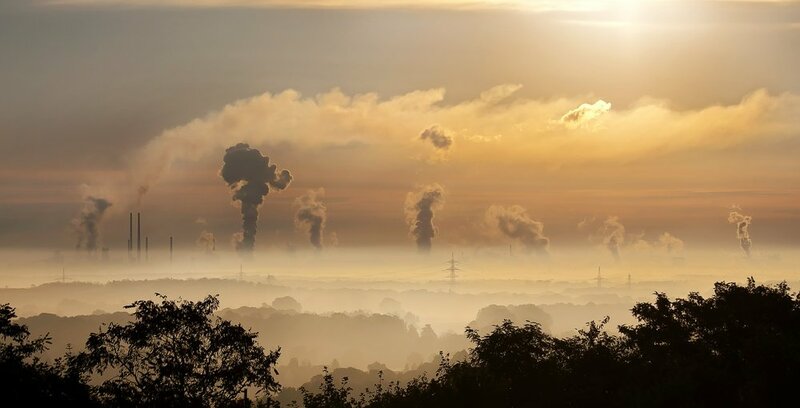 However, the profound economic and health implications of air pollution on poor cognitive function may largely underestimate the real costs of pollution. Realizing the severity of this issue, the U.S. EPA calls for more research to assess the impact of ambient air pollutants on central nervous system function, such as cognitive processes and addresses the adequacy of existing standards. In the case of Medicare Part D choices, modestly reducing annual average concentrations of PM2.5 by 1 μg/m3 would help consumers save more than $60 million per year on prescription drugs and yield further potential gains in consumer welfare by reducing the probabilities of choosing drug plans off their efficient frontiers. Moreover, the same moderate reduction in PM2.5 would reduce the rate of dementia by 1% to 3% (around 100,000 to 300,000 cases), lowering direct medical expenditures on dementia by $3.5 to $10.5 billion per year in 2017 dollars. Such a large social cost can be avoided due to individuals’ strong willingness to pay to improve air quality as public goods. An average Chinese resident is willing to pay $88 per year (or 3.8% of annual income) for a 1 μg/m3 reduction in PM2.5, while an average U.S. resident is willing to contribute as high as $891 (or 2.1% of annual income)v. Although people in the U.S. on average seem to be willing to pay a much higher amount in absolute terms, Chinese residents are more willing to pay a larger share of their income. When we obtain most reliable values of willingness to pay for major population groups in each country, policy makers will be able to learn the potential demand and how they can match the demand and supply of good air for cognitive activities and beyond. Chen, H et al. 2017. Living near major roads and the incidence of dementia, Parkinson's disease, and multiple sclerosis: a population-based cohort study. The Lancet 389 (10070): 718-726. Ng, JB, M. Turek, and AM. Hakim. 2013. Heart Disease as a Risk Fac-tor for Dementia. Clinical Epidemiology 5: 135-145. Cacciottolo et al. 2017. Particulate air pollutants, APOE alleles and their contributions to cognitive impairment in older women and to amyloidogenesis in experimental models. Translational Psychiatry 7: e1022. Isen, A., M. Rossin-Slater, W. R. Walker. 2017. Every Breath You Take - Every Dollar You’ll Make: The Long-Term Consequences of the Clean Air Act of 1970. Journal of Political Economy 125(3): 849-909. Levinson, A. 2012. Valuing Public Goods Using Happiness Data: The Case of Air Quality. Journal of Public Economics 96: 869–880. Zhang, X., X. Zhang, and X. Chen. 2017a. Happiness in the Air: How Does a Dirty Sky Affect Subjective Well-being? Journal of Environmental Economics and Management 85: 81–94. Zhang, X., X. Chen, X. Zhang. 2018. Environment and Subjective Well-being. Forthcoming in Handbook of Well-being, Happiness and the Environment (Edited by D. Maddison, K. Rehdanz and H. Welsch). Edward Elgar Publishing Ltd.
Chen, X., X. Zhang, X. Zhang. 2017. Smog in Our Brains: Gender Differences in the Impact of Exposure to Air Pollution on Cognitive Performance. IZA Discussion Paper No. 10628. Bishop, K., Ketcham, J., Kuminoff, N. and C. Powers. 2017. Hazed and Confused: Air Pollution, Cognitive Functioning, and Financial Decision Making among the Elderly. Arizona State University Working paper. Agarwal, S., J. Driscoll, X. Gabaix, and D. Laibson. 2009. The Age of Reason: Financial Decisions over the Life-Cycle and Implications for Regulation. Brookings Papers on Economic Activity 40(2): 51-117. Keane, MP., JD. Ketcham, NV. Kuminoff and T. Neal. 2017. Evaluating Consumers’ Choices of Medicare Part D Plans. Working Paper. Heyes, A., Neidell, M., and S. Saberian. 2016. The Effect of Air Pollution on Investor Behavior: Evidence from the S&P 500. NBER Working Paper No. 22753. Chew, SH., Huang, W., and X. Li. 2017. Haze and Decision Making: A Natural Laboratory Experiment. National University of Singapore working paper. Herrnstadt, E. and E. Muehlegger. 2016. Air Pollution and Criminal Activity: Evidence from Chicago Microdata. NBER Working Paper No. 21787. Fang, HM, M. Keane, A. Khwaja, M. Salm. and D. Silverman. 2007. Testing the Mechanism of Structural Models: The Case of the Mickey Mantle Effect. American Economic Review Papers and Proceedings 97(2): 53-59. Zhang, Zhang, Chen. 2017b. Valuing Air Quality Using Happiness Data: The Case of China. (with Xin Zhang, Xiaobo Zhang) Ecological Economics 137: 29-36. Financial support from the James Tobin Research Fund at Yale Economics Department, faculty research grant awarded by Yale Macmillan Center (2017-2019), the U.S. PEPPER Center Scholar Award (P30AG021342), NIH Career Development Award (K01AG053408), and a NIA grant (R03 AG048920) are acknowledged. Xi Chen is an assistant professor of health policy and economics at Yale University. He is a Research Fellow at the IZA Institute of Labor Economics, Fellow and Cluster Lead at the Global Labor Organization, Senior Consultant at the United Nations, and President-Elect of the China Health Policy and Management Society.